I was recently removing some of the software development applications, tools, and files I had used from an old Vista-based laptop because the people who are primarily using that laptop now have no interest in software development. As part of that effort, I tried to remove JavaFX Scene Builder 1.0, which I had installed a couple of years ago on that laptop. I hadn't used it recently (JavaFX Scene Builder 2.0 is available) but I had not removed the version from the laptop when I stopped using that old version. My first attempt to remove JavaFX Scene Builder 1.0 was via the Windows Vista menu option Control Panel | Programs | Uninstall a program. The next screen snapshot shows this version of JavaFX Scene Builder 1.0 that I wanted to install along with the version of Java installed on that machine (JDK 8 and Java 8 JRE). No versions of Java (JDK or JRE) before Java 8 were on this machine. 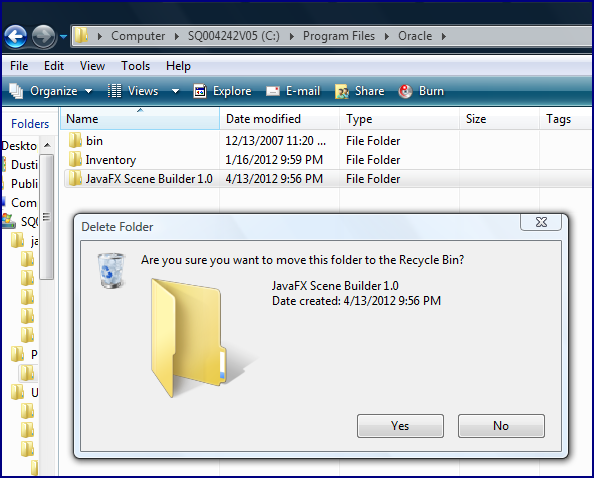 The next screen snapshot demonstrates the normal requested confirmation of the removal of JavaFX Scene Builder 1.0. Clicking the "Yes" button on the confirmation dialog just shown led to the removal process beginning. Unfortunately, the removal of JavaFX Scene Builder 1.0 aborted and showed the error message: "No suitable 32-bit Java Runtime Environment (JRE) has been found. You should install Java 6 Update 29 (32-bit) or above OR Java 7 Update 2 (32-bit) or above." I was a bit surprised that JavaFX Scene Builder could not be uninstalled with a Java 8 JRE installed on the machine. I tried to uninstall it more than once to make sure, but it was resistant to removal with only JRE 8 installed. I ended up simply removing the JavaFX Scene Builder 1.0 directory with Windows Explorer as shown in the next screen snapshot. 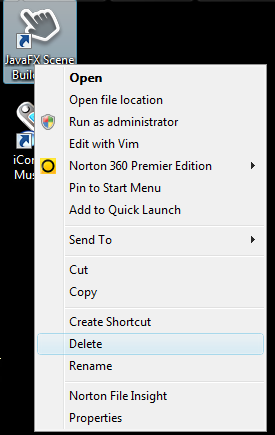 Because I could not use the uninstaller to remove JavaFX Scene Builder 1.0, I also needed to manually remove the shortcut as shown in the next screen snapshot. It was not a big deal to remove the directory and shortcut when the installer was unable to remove JavaFX Scene Builder 1.0 from this machine. 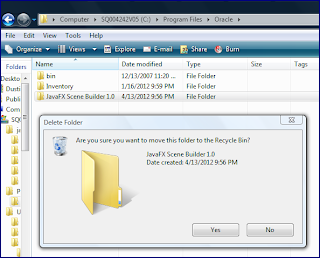 It also would not have been too difficult to download and install a Java SE 7 JRE to use in uninstalling JavaFX Scene Builder. However, I was a bit surprised that it was written so that an appropriate version of JRE 6 or JRE 7 was required. It explicitly prevents JRE 8 or any future JRE from being used to uninstall it. I saw this same type of situation recently with a different tool in a different environment. In that case, the version of SQLDeveloper being used would only work with a certain specified range of updates for Java SE 6 and not for any Java SE 6 updates outside of that range and not for any versions of JDK 7 or JDK 8. There is a software development reminder (or lesson to be learned) from this. It is easy as humans to think only about the current timeframe and about the past, but we as software developers should put some thought into what the future holds. The prevailing version of software is not always going to be the prevailing version and when our software's documentation or the software itself advertises supporting certain versions "and above" or "and later," then we should probably not put an explicit check in our code that forces the software to have the one of the expected major revisions or that caps the supported versions.